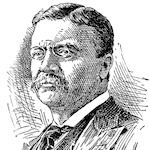 Theodore Roosevelt, Jr. was the 26th President of the United States from 1901 to 1909. He was also governor of New York, a historian, naturalist, explorer, soldier, and author. At the outbreak of the Spanish-American War in 1898, Roosevelt formed the First U.S. Volunteer Cavalry Regiment, known as the "Rough Riders." He wrote 35 books, covering such diverse topics as outdoor life, natural history, the American frontier, political history, naval history, and an autobiography. The Rough Riders’ time in Tampa is filled with misunderstandings which they deal with as best they can. FCIT. "Theodore Roosevelt author page." Lit2Go ETC. Web. 18 April 2019. <https://etc.usf.edu/lit2go/authors/76/theodore-roosevelt/>. FCIT, "Theodore Roosevelt author page." Accessed April 18, 2019. https://etc.usf.edu/lit2go/authors/76/theodore-roosevelt/.